Mattress Hotels. Sleep on it. Mattress companies... WAKE UP! You're missing obvious marketing partnerships... with HOTELS! This idea is so simple, it boggles my mind. 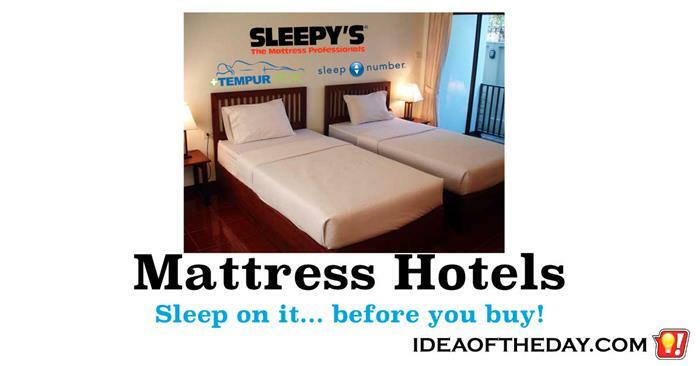 Every time somebody checks into a hotel, there's a golden opportunity for customers to test drive mattresses. Let's say you're checking into a hotel, in addition to asking for a non-smoking room, wouldn't it be great if you were also asked "Tempur-Pedic, Sleep Number, or Sealy"? If you're planning on staying more than a few days, that's a great opportunity to try all three, or more.